All of our AXN™ Guitars are packed full of small details that when you add them up define our guitars as simply the best guitars you can buy today. Our AXN™ guitar bodies and necks are shaped and manufactured in the United States, by hand the old-school way, and from the finest tone-woods available. With our own eyes we pick choice exotic woods from local USA suppliers. Wood that is perfect for manufacturing tone-full guitars. AXN™ guitars incorporate unique specifics and common sense appointments such as a single perfectly placed volume knob and minimized control cavity holes that keep precious body wood. Our AXN™ guitars secret paint formula includes super thin color placed in strategic places with ZERO clear-coat. 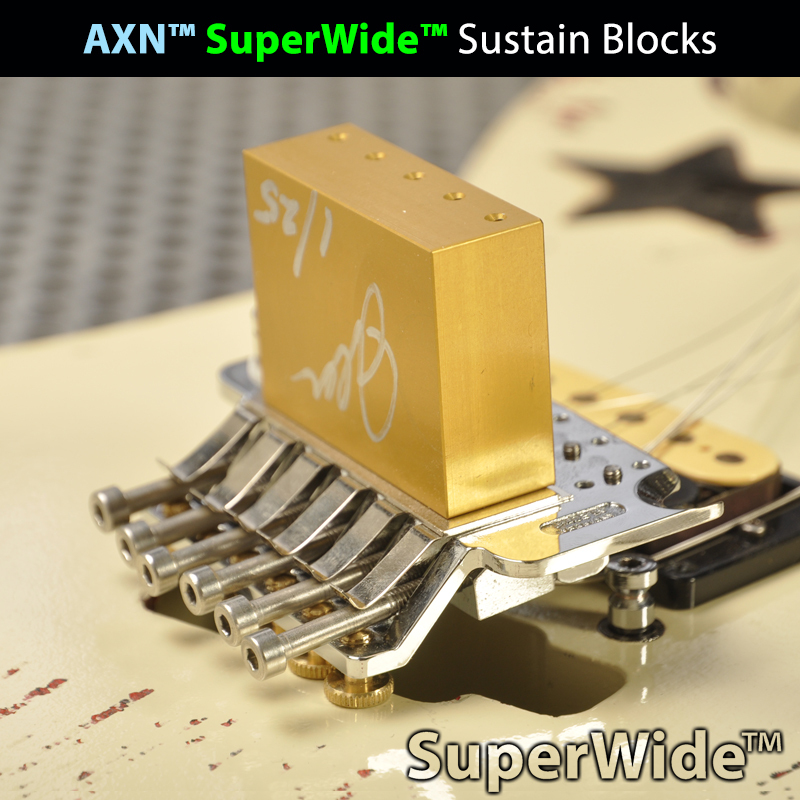 In pursuit of perfection with our AXN™ Guitars we use things like AXN™ SuperWide™ Sustain Blocks, German Made Floyd Rose bridges and our experience to choose the perfect pickups to match the guitar. We are artists who take pride in every detail. Nearly all new guitars sold today are made of very poor quality woods sandwiched in between a nice looking paint job. Buying a name brand guitar today is sort of like buying a creme puff filled with horse manure. That said, the BIG TWO guitar brands are very aware of the secrets to making great guitars. They set the standard for great instruments many decades ago. Its all very sad when you recall that vintage 1950s and 1960s instruments from these once innovative brands hold legendary status with guitars players and luthiers. Ironically the 1950s and 1960s Strats and Les Pauls contain within them all the secrets to a great guitar tone. Yet either out of corporate profiteering, ill-disposed intentions or bad management, the Big Two brands today offer mostly sub-par instruments made in third world countries. Discussed in this article are 10 tone secrets. We have discovered some of these by trial and error. Some are details well known. Many of these secrets have been talked about more recently in the last decade or more. Therefore we have found that the superior tone associated with superior instruments is NOT such a secret at all. The best guitar tone has to do with a certain direction the lumber is cut from logs. Equally important is the dryness of the timber. How the guitars finish, or lack thereof, interacts with the specific wood type after manufacturing can suppress or enhance tone. Tone is vastly improved by the type of metals and hardness factor of the alloys used in certain parts of the hardware. This defines clarity improving the "snappy-ness" of the string. After many years we found that the tone associated with superior sounding instruments is NOT such a secret at all. Long before the launch of our AXN™ line we obsessed in the details present in those famous guitars from the 1950s, 1960s through to the 1980s. After decades of study, experience and application we discovered certain things are always present in a very tone-full guitar. Here is a list of secrets that we will disclose about our AXN™ guitars. AXN™ guitars utilize quarter-sawn and center-joined wood in our bodies. In addition we hand pick aged woods from local suppliers here in the USA and use the perfect tone-wood to start the process of manufacturing our AXN™ guitars. AXN™ guitars utilize quarter-sawn woods in our hand crafted necks. Again, we hand pick aged premium woods from local suppliers. We don't use CNC machines which create sterile guitars. Using quarter-sawn quality woods selected by hand is one important detail. Virtually NO production line guitar or known guitar brands start with this crucial detail in check. We start by personally shopping for the best woods available and use those in our first step of production. Its just one detail that we include in the overall formula for making an AXN™ Guitar. There is very much information to disclose in regards to metal hardware and musical instruments. Nearly all guitarists can tell the difference between a bridge that has a sparklingly sound transfer ability and a poorly made pot-metal bridge that chokes. Some of the relative sound differences is mathematical having to do with the percussive nature of each metal and also the speed of the vibrations etc. The vibration of the guitar string on a fixed bridge and also the string locked into a Floyd Rose tremolo transfers this vibration through the mass generating a tone structure. Appropriately, and over the decades with the advent of modern alloys, a debate has transpired as to what size and which metal type is best for bridges and hardware. Hardtail traditional bridges and tremolos that have sustain blocks, baseplates, and metal saddles have appeared that are machined from premium metals. The advantages of quality metals has become apparent and has been appreciated by many a guitarist. Our USA Designed and USA manufactured AXN™ Model 2 guitar bodies have a custom size tremolo cavity hole with a precise fit for our humongous AXN™ Sustain Block. 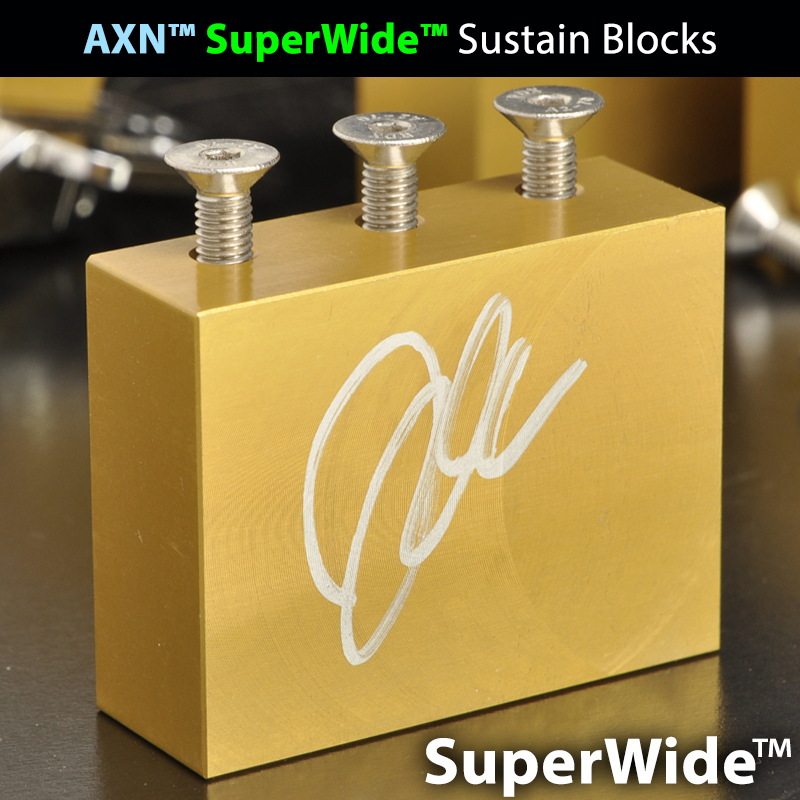 Our specialized AXN™ SuperWide™ Sustain Blocks are effectively 5 Times Larger than a standard Floyd Rose sustain block. This drastically improves its sonic attributes and enhances the flutter effect of a Floyd Rose tremolo on our guitars. 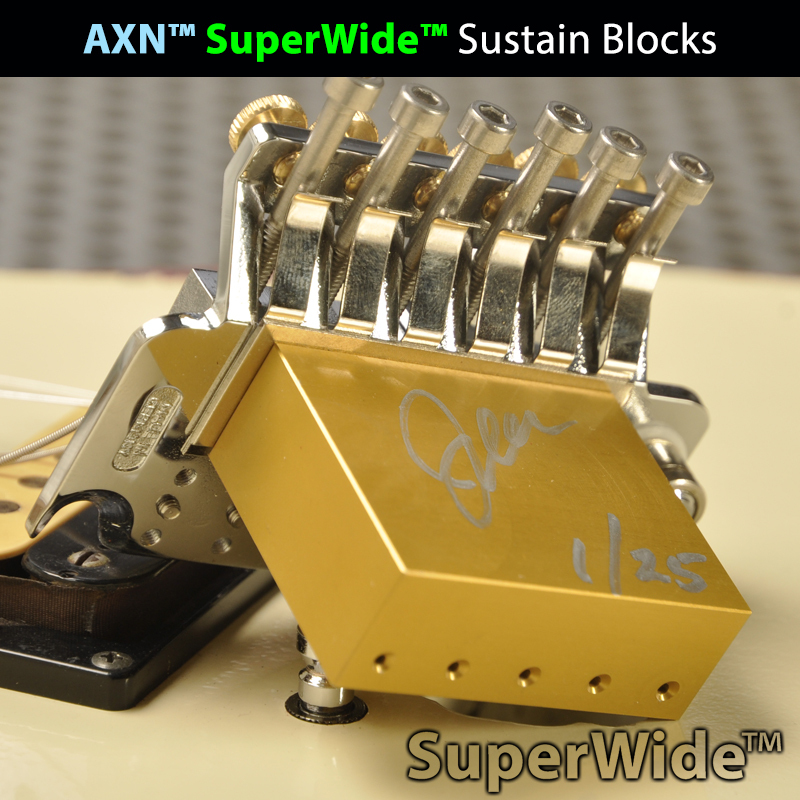 Get the Ultimate Floyd Rose Experience... Get an AXN™ !! For jazz and even pop music the size of the sustain block or size of the bridge in a guitar might make little-to-no difference. For rock, metal and more aggressive guitar sounds the girth, size, mass and sheer magnitude of the metal used in the bridge may be one of, if not, the most important tone-influencing details. We have bench tested the "wave" and delved deep into other fundamental tests which caused us to arrive at the single pickup guitar body. It is logical that this pickup configuration makes sense tonally. Pictured above is an AXN™ Model 2 guitar. This AXN™ guitar is made to do only one thing... ROCK. The single pickup configuration is a powerful option offering exceptional tone and versatility. A single pickup guitar body where wood mass is strategically focused is no new thing nor is it a big secret. Executed properly more wood adds up to a robust, aggressive and superior rock-n-roll tone in our AXN™ guitars. We discovered after years of building guitars that the control cavity placement as well as pickup routing play a large role influencing the vibration of the guitar string and harmonic sustain. The control cavity in the back of the guitar where the electronics is fed through the body is always in one of the most important areas of the guitars tone-wood. If you look under your guitars pickguard the wood removed there for pickup placement is equally as vital to a guitars sound. These both are undisputed tone-influencing areas of the guitar body. When the electronics control cavity size and pickup routing size is decreased and wood mass in those areas is increased so is sustain. Therefore the influence of wood mass in these spots changes the sound wave. These are important details we use to shape the tone of our AXN™ guitars. Effectively you could describe the removing of wood in these areas as "chambering". Strategically these two places are the worst spots to chamber a guitar... Big electronic control cavity and swimming pool pickup routing... terrible ideas for a rock-n-roll guitar! The shape or girth of the guitar body where the heel of the neck attaches is yet another very important factor that influences tone. As well, the wood mass around the tremolo posts where a tremolo bridge is attached to the body is the worst place to remove wood. Decreasing the amount of wood or routing-out wood under the guitars bridge is the quickest way to destroy sustain in an already tone robbing bridge type such as a Floyd Rose locking tremolo. Add a bridge made from a low quality metal alloy and what you've got is the recipe for a disastrous treble-ey tone. These tone robbing technics are even more apparent when a guitar is amplified in a live band environment and in higher volume conditions. In reality many good things such as neck shapes, humbucking as well as active and noiseless pickups, came out of the 1980s innovations to the classic guitar designs of the past. That said, a contoured or shaped neck pocket and recessed tremolo routing are two things that diminished tone and pushed players towards set neck guitars during the vintage guitar craze after the 1980s. Our AXN™ Neck Joint where the body meets with the neck is designed to allow absolute access to the highest frets all the while preserving sustain. We've achieved the perfect combination of comfort and playability in every detail. Below is a photo of our AXN™ guitar featuring a Korina neck and a ultra-prime cut of Alder tone-wood for the attractive body. Most likely every guitar you own is covered with tone-robbing finishes and paint fillers. The thicker the clear coat is the more precious tone you loose. Although considered attractive all these beautiful paint jobs restrict the woods ability to naturally breath and age. The entire finish effects the sound. Both the neck and the body finish play a role. All guitar makers know that widely used veneer, glue and clear coat effect the way a guitar will sound when amplified. These rob the wood of its natural resonance. Virtually all new electric guitars bury the natural wood under a ton of rubbish including low quality paint. We sell guitars with very-little-to-no finish and NO clear coat. When wood is covered with paint we use our own special formula to color our AXN™ Guitars. We were able to achieve a superior tone that is the perfect match for hard rock players by not using detracting decorative paint and veneers. It becomes the difference between bass and treble, frequency response, and what part is effected by the absence of paint. Similarly the presence of specific types of primers and paint types skew or modify tone. This is no "big tone secret". For decades guitar makers have understood tone-killing clear coat and paint are a suppressant. Heres one interesting fact, there is one well known guitar brand from Japan that markets a primer they use on some of thier guitars that generates an exacting amount of mid-range boost. All AXN™ guitar necks as well as AXN™ guitar bodies are free of paint or clear coat. This results in enhanced resonance and sustain. Thus improving the guitars overall performance through an amplifier at higher volumes. A Faraday cage or Faraday shield is an enclosure used to block electromagnetic fields. It is formed by conductive material or by a mix of such materials. The Faraday cage is named after the English scientist Michael Faraday who invented this in 1836. A Faraday Cage in our application works to effectively isolate the inner areas from outside noise. 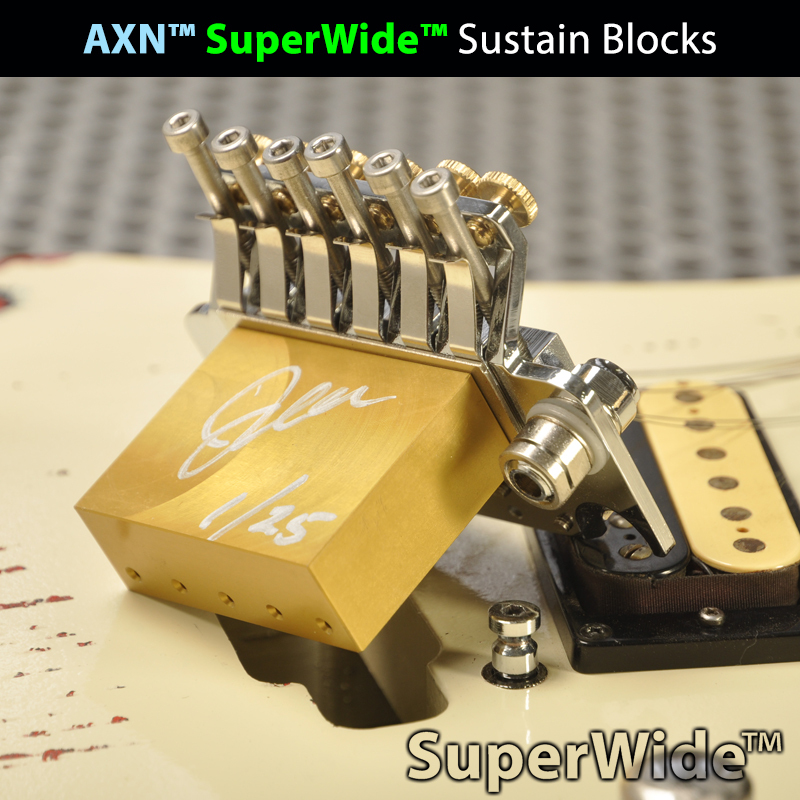 In our AXN™ guitars the cavities around the electronics and the pickup route are converted to be a caged-in box with metal shielding materials. These areas of the guitars body are then successfully grounded, further shielded, and incorporated into the guitars overall grounding circuit. We then achieve a perfectly robust sound signal for processing through an amplifier and guitar effects. This leads to the silky smooth distortion and sparkling clean tones of our AXN™ guitars. This shielding/grounding technique and all our other methods help contribute to a very targeted heavy rock-n-roll tone at all amplified volumes. Quite simply its one of our proprietary tone secrets. The proper execution of this shielding measure in the production of electric guitars is much too labor intensive and costly for large guitar manufacturers to utilize in their product offerings. Its a standard detail in every AXN™ guitar. We call it the AXN™ Electronics Grounding System. We also utilize a custom sophisticated AXN™ Adjustable Treble Bleed Circuit that keeps just the right amount of mid-tones, treble and cleans when you back off the volume and back-out distortion. At AXN™ Guitars we use a high quality 500k Bourns volume pot and Aerospace Mil Spec M27500 wire/rope throughout the guitar. The pickups are basically big magnets that draw the strings toward them and slowly kill the vibration of the string. If you continually raise the pickup closer to the strings you will be able to verify this fact. Of course if the pickup is very close you can visually see the pickup grab and stop the strings vibration. The more pickups your guitar has installed the more vibration is soaked away from the strings. Sounds crazy but for much longer sustain less pickups in your guitar will achieve that result. Its common knowledge that Mahogany produces a warmer tone which would be even warmer than Korina. These two woods would enhance areas of the sound spectrum opposite to Hard Maple and Walnut which both produce a bright tone. Hence, a Les Paul would have a brighter tone if the maple top was thicker than the mahogany back. Another factor that all guitarists understand is that your neck position pickup produces a warmer tone than your bridge pickup. In addition if you play lead guitar you easily can tell the difference when playing on either the neck pickup or the bridge pickup. With this in mind it makes sense that the pickup distance ( or the distance of the pickups pole pieces ) when moved away from the bridge, or tremolo, create a different sound. In the same way when every guitarist chooses a new pickup we listen for the articulation of the bass strings versus the treble strings and decide what pickup we prefer for each of our favorite guitars. After a number of years all guys that play guitar start to understand which magnet type or brand of pickup mate to the corresponding wood types. In general we guitarists are use to a certain sound from a distorted humbucker pickup based on where the pickup is on a guitar (specifically, its proximity to the bridge). When chugging around on our bridge pickup we expect to hear a certain response from each string as it related to bass and treble response. The basic rule is this: the closer a pickup is installed in relation to the bridge, the brighter its tone will be... and the further away a pickup is installed in relation to the bridge, the less bright its tone will be. In theory lets take the following example. If a standard Stratocaster with single coils had its single coil bridge pickup oriented perpendicular to the strings ( straight across ) like the middle and neck Strat pickups, the tonal quality of the bridge pickup would be terribly thin on the E, A, and D strings. The further from the bridge you move the Stratocaster bridge pickup the warmer the tone becomes. Take a look, all Stratocasters have a slanted bridge single coil pickup. A slanted bridge humbucker pickup would put the poles that line up with bass strings further forward and the treble strings just a hair back. This orientation would, if it was needed, change the tone ever so slightly. The E, A, and D strings would achieve a distinctive bass harmonic change and the G, B, and high E strings would be closer to the bridge to supply treble harmonics that subjectively cut through and offer a more compressed high end. As guitar luthiers, this slant pickup orientation is available to use as a tool. If you so desire a slanted humbucker can be used to change the sound. This in combination with other factors such as the wood type of the guitar body and neck, the wood type of the fretboard, the metal alloys used in the hardware and bridge, the type of magnets in your pickups and numerous other factors in the makeup of said guitar are an influence. Our test show that a slant humbucker can produce a wider spectrum of sound with certain tone-woods that can benefit from the push. Also our test results show that the results of a slant humbucker can also be null with some wood types and pickup combinations. Another thing to understand is the effect of slanted pickups as they relate to the scale length of the guitar and issues that arise with longer scale length and guitars that use large amounts of gain or distortion. Take a look at the 7 and 8 string guitar makers of today. They are using slanted pickups for a reason. That reason further substantiates our findings. In closing, a humbucker and the placement of your humbuckers 6 pickup pole pieces do effect the tone when distance from the bridge is varied. The understanding of this is just another method used as a tool to refine the strings audible response when amplified. Therefore its just another tone secret that can be used to compliment your sound for whatever style of playing you desire.